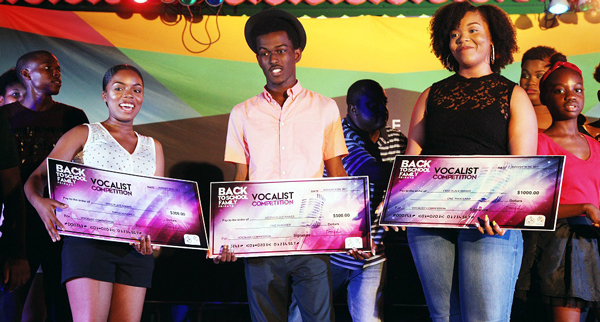 Winners of the 2nd Annual BTS Vocalist Competition, pictured from left to right: 3rd Place Winner of $300.00 cash prize – Anna-Kay Green; 2nd Place Winner of $500.00 cash prize – Anton Stubbs and 1st Place Winner of $1,000.00 cash prize – Berlicia Saunders. Grand Bahamas – ‘Test Your Talent’ was the theme of last Friday night’s vocalist competition at the Port Lucaya Marketplace, where more than a dozen competitors took to the stage, vying for the grand prize of $1,000 cash. For nearly two hours residents and visitors were wowed by a spectacular display of local talent, while enjoying live performances from some of the country’s best entertainers.